This Shaker rocker and side table show off the style’s essential design elements including the ladderback and brightly colored cloth tape seat on the chair and straight gently curved legs of both pieces. The above quote is usually attributed to Mother Ann Lee, founder of the Shakers, whose style of furniture lives on even as their sect as dwindled to a few remaining members. Much of the enduring appeal of Shaker furniture lies in the three P’s: plainness, practicality and pride that were reflected in everything a Shaker set his or her hands to. Shakers made furniture for their own use as well as for sale to the public. Although similar in style to Mission furniture, Shaker furniture is often considered more elegant because of its refined simplicity of form and the ingenuity of construction. Popular forms of Shaker furniture include tables, chairs, rocking chairs, and cabinets. One of the most widely recognized pieces of Shaker furniture is the Ladderback chair which was designed to hang on wall pegs for easy cleaning of the floor. To truly understand Shaker furniture, one needs to know a little about the religion that inspired it. Shaker furniture’s style and quality did not come from the desire to create something of beauty, but was a byproduct of the Shaker’s religious beliefs. All work was done to glorify God. Mother Ann Lee believed she was the second incarnation of Christ and that she and her followers were living in the Millennium – the thousand year reign of Christ on earth. Far from creating a production mentality, it produced the idea that one had a thousand years to get it right. Because each piece was an act of worship, Shakers were going to make the best furniture possible. At its height in the 19th century, the Shaker movement included some 6,000 members, living in 24 villages stretching from Maine to Indiana. Shakers believed that salvation lay in hard work, abstinence from worldly pleasures, and constant prayer. All Shaker property was communally owned and celibacy was insisted upon. So much so, that when families joined the Shaker community, husbands parted from wives, and children from parents. Shaker craftsman used inexpensive local timbers which included maple, pine, cherry, walnut, hickory and popular. Furniture was often painted vivid colors to hid dirt– typically red or dark green were used – although yellow and orange were also used. Varnish was also used to bring out the natural grains of the wood. Tenon and mortise joinery or dovetailing rather than nails or screws were used to put pieces together. Many pieces were large because they were used for communal living, but ingeniously designed for storage and easy portability. Tables had drop leaves and legs that unscrewed. Chairs, like the Ladderback, were designed to be hung on pegs. Decorative elements such button or mushroom like knobs, long “finger” joints, and wide slats were often part of the structure of the piece. Chair tops were adorned with acorn-, pinecone- or flame-shaped finials. Legs are often tapered with a gentle swelling in the middle. Furniture generally had no feet or simple bracket feet for cases or arrow or pear feet for chairs. Woven cloth tapes, made of colorful fabrics arranged in checkerboard patterns, replaced the caned backs and seats on chairs because of the greater comfort and durability they offered. From the time Mother Ann Lee arrived with her followers in New York in 1774 and began making their distinctive furniture for colonists, the Shaker influence on American aesthetics has been profound. Designers as diverse as Gustav Stickley and Charles Eames acknowledged the influence of Shaker furniture on their work. 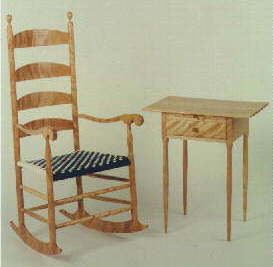 Many believe Shaker furniture was also a precursor to the Danish Modern style. While the extreme self-denial practiced by the Shakers seems out of tune with our times – only one active Shaker community remains today in Sabbathday Lake, Maine – the desire for things enduring continues. Large pieces of original Shaker furniture can fetch up to five or six figures. Countless individual furniture makers produce pieces in the Shaker style and at least one factory in the United States employs skilled craftspeople to turn out Shaker pieces using their traditional designs and methods. The work that was done “as if you had a thousand years” has produced a legacy that continues to grow. Hi, i am the owner of elobing.com .Thank’s for sharing this news.This is very helpful and informative material.Good post and keep it up friend.